Wrestlemania 27 Predictions ~ The Bucky Channel - The World of Sports from Wisconsin's Perspective. As much as I try to deny it, I'm into wrestling. It's strange, I never watched it growing up, then got into it for like six months in college when I was working at a UPN station which aired Smackdown!, but then after that I didn't watch an episode. Then, I move back home when I'm unemployed, shack up with the rents, and next thing you know I fall into the stereotype and I'm a wrestling fan. I used to do predictions for every pay-per-view but stopped doing that because I was posting on wrestling for God's sakes, but hey, you are who you are, and I am a wrestling fan. So here are my predictions for Wrestlemania 27 (I'm pretty confident in these too, in fact I guarantee the most I get wrong is one, and that's going to be the Cena/Miz match. But we'll see). Barrett, Gabriel, and Slater used to run in the Nexus, which I thought was an awesome faction. But John Cena, as he always does, belittled their existence and they were banished to Smackdown to form The Corre. They picked up Jackson along the way, and their faction currently holds the Intercontinental Championship as well as the Tag Team Championship. Yet, they seem to lose on TV each and every week. It's a joke, really. I like The Corre, misspelling and all, and think that they should own Smackdown. Eventually I'd like to see them hold all the belts, but the only person that is worthy of the World Championship is Barrett. Maybe Barrett wins that title this summer, and just goes ahead and gives Jackson the Intercontinental belt. There's nothing like a strong faction in wrestling, and these guys have the tools to make it work. There's no way they lose this match, as their opponents are a joke. The Big Show, Kane, and Koslov were all heels a year ago at this time, and the fact that Santino Marella is on the card and Kofi Kingston and Christian are not is appalling. Word is that Kofi may replace Koslov, but we'll see. I love Daniel Bryan. At least, the character that he was before Vince McMahon made him come out with slutty divas every week. And I loved him as the United States Champion, but he wasn't really doing anything. He needed a feud, and this is that feud. Yeah, Sheamus did go from WWE Champion to afterthought pretty quickly, but he's coming back on the scene with this reign as the "Champion of the United States of America", as he calls it. When Bryan dropped the title to Sheamus a few weeks ago, my first thought was that it was to set up a Wrestlemania match between the two, and Bryan would win the title back at that time. But now that we're just hours away from the event, I'm thinking Sheamus is going to retain and the feud will continue. Neither of these guys have anything better to do anyway, and I think Sheamus wins here, and then loses the title back to Bryan within the next couple of months before going on to bigger and better things. From what I understand, Trish Stratus was at one time the hottest diva in the WWE. She's an afterthought in this match though, as all the focus will be on Snooki and how much she'll actually wrestle. John Morrison and Dolph Ziggler deserve a lot better than this match, in fact, I wouldn't be surprised to see these two wrestling for the title at this time next year. But for now, they are in this sideshow, and I don't see any way that the faces lose the match (even though she gets booed, Snooki is being considered a face). Rhodes was the handpicked opponent by Rey Mysterio for Wrestlemania, and the two have put together a pretty good feud so far. I never would have expected that Rhodes would be both wrestling and giving promos this well at this time a year ago when he was still in Legacy, but he's really impressed me. As much as the crowd is going to want to see Mysterio to win, I think part of the reason he selected Rhodes was to elevate the kid a bit moving forward. A win against Mysterio at Wrestlemania would be a huge step in the right direction for Rhodes, and bigger and better things are likely in his future. These are two of my favorite wrestlers, and they have the potential to put on one hell of a match. When this feud started, it was Orton versus the New Nexus, but RKO has pretty much eliminated the one top dominant faction via punts to the skull. A punt to CM Punk's head would make sense storyline wise, but I don't see any reason why creative would want to write Punk off of TV for while, so that's out. With the way that Orton was plowing through Nexus, it was looking more and more like he would go over Punk at Wrestlemania, but they recently through in an injury angle with Orton's knee. Scripted injuries usually one thing, and that is that the injured guy is being set up to lose, but is going to be hurt so that they don't look weak by losing the match. I think that's what is happening here. Cole has went from dorky announcer to the most hated heel in the WWE, and it'll be interesting to see if they try to bring him back to Earth after this match or if he'll transition into a manager/GM role. Either way, this is the easiest match to predict as there is no way Jerry Lawler loses here. This feud has been built up like the infamous Lawler/Andy Kaufman rivalry was all those years ago. Each week on Raw, Cole is getting the better of Lawler and will pay for it here. Del Rio decided to go after Edge after winning the Royal Rumble, and I'm assuming that decision is going to pay off for him come Sunday night. Del Rio is great. He's got the look, the moves, the personality, the act - he's the whole package that you want in a heel. And he's not a cowardly heel either, he's aggressive and violent. He's been elevated quickly since he joined the WWE roster, and deservedly so. I'm quite sure he gets the strap from Edge, but how that all goes down remains to be seen. What role will Brodus Clay have? How about Christian? This is far fetched, but of all the people that they've hinted could be the Raw GM, most of the signs have pointed to Christian. Could he somehow insert himself into this match and make it a triple threat? If that were to happen, I still think Del Rio wins the belt and then long-time friends Edge and Christian would feud with each other, with Edge turning heel again. The only reason I'm skeptical about Del Rio winning is I'm not sure who'd he face next for the title, as Smackdown is light on top babyfaces. I guess the WWE draft is coming up, so that can always be solved. What I want to happen: The Miz finally gains credibility with a win over John Cena on the biggest stage of them all. He wins with outside interference from The Rock, who still has a score to settle with Cena. After the match, The Rock puts his finisher on the Miz to give the crowd a happy ending. But, Cena comes back and beats the hell out of Rocky, prompting the heel turn I've been waiting for since I first started watching this product. What I pray doesn't happen: The Miz looks weak and loses to Cena. The Rock comes out. Rock and Cena have a stare down but they shake hands and everyone is happy. What I am at least hoping happens, and am predicting: The Miz does beat Cena with outside interference from The Rock. Rocky and Cena make up for the happy moment to end the show, but The Miz is still the champion. 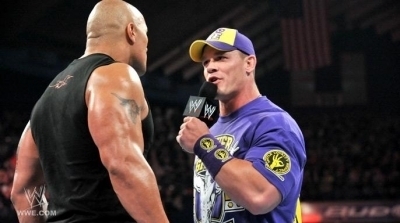 Honestly, it makes so much sense to have Cena turn heel here and then have him face The Rock at Summerslam. It's what every internet wrestling fan wants to see happen, but then again, the internet doesn't really like John Cena. Cena is for the kids because he's corny and not even that good of a wrestler in comparison. But his merchandise makes so much money that it's ridiculous. Cena has always been too the WWE's go-to guy from media appearances and such, a role that The Miz has been doing as of late. My dream scenario here would be a heel turn from Cena and then a slow face turn from The Miz. I would go crazy - Packers Super Bowl crazy - if that happened. It's hard to admit sometimes, but I am a wrestling fan. I will honestly be furious if Cena wins this title. He doesn't need it. The Miz needs it. Make it happen, Vince.